Along with a dozen beautiful believers-under-construction, I am re-reading the classic ‘Celebration of Discipline‘ by Richard Foster. Clearly an oxymoron to the spiritually faint of heart, Foster makes a strong case for placing the words ‘Celebration’ and ‘Discipline’ into the same sentence. Week after week my small group of women comes together to wrestle with the possibility that the result of a disciplined life might really be something worth celebrating. This is also the way, by the way, of the lesser-known Spiritual Discipline of Defragmentation. You’ve probably heard of the classic Disciplines – things like prayer, study, service and worship. Words that have in many circles become so churchified that they have essentially lost their meaning and, consequently, their practice has ebbed as well. Perhaps it’s time for a more culturally relevant illustration in making a case for the benefit of focusing our attention more purposefully on God. Defragmentation, also known as defragging, is a process that takes all the file fragments scattered across a computer’s hard drive and rejoins the multiple pieces of each file into one area. This can speed up your computer, save you time and extend the life of your hard drive. Defragging can be a lengthy process, but it is an essential part of regular computer maintenance. The definition begs the question: does this sound like you? Does your inner-life contain fragments of thoughts, memories, ideas, plans, lists, activities and schedules? Are your relationships and priorities scattered across your mind and heart in the form of pieces – a little bit here, a little bit there? One predictable side effect of life is fragmentation, and women know as well as anyone what years of multi-tasking can do to the most well-intentioned follower of Christ. We know we need to change. We feel the need to change. We really WANT to change! But until we let go of our desire to CONTROL the change we need the most, we haven’t got a chance. Enter… the Spiritual Discipline of Defragmentation. You may have taken your computer through the process of defragging, so let’s start there – with what we know. 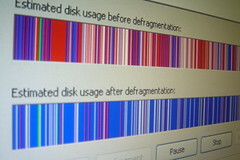 To defrag your system, you access your computer’s control panel and select the ‘defragment your computer‘ option. There’s a great visual provided by most computers when you opt to ‘analyze’ your computer before defragging. After a few minutes, your computer will show you what your hard drive looks like – in full color – with bits and pieces here and there throughout the drive. Disorganized. Inefficient. Hard to navigate. Time consuming. So you take the next step and you click ‘defragment‘ and the magical process begins. You sit there. Watching. Waiting. Knowing that good work is being done. Knowing that this is out of your control now. The computer is doing its work and soon a new picture will display, with bits and pieces that have been rearranged and put back together in a way that makes much more sense and much better use of your system. Wow! What an amazing tool! In the spiritual life, your head and your heart are your operating system – your ‘hard drive’ in techie terms. The Spiritual Discipline of Defragmentation requires that you open up your control panel and give that control to the Operator – the One who knows how you run best. The One who created you! Let Him show you how the bits and pieces of your life are scattered and disorganized. Allow Him to analyze your true state and to make His case for the defragmentation of YOU! The next step is actually your FINAL step, and that is to make the click. Choose to begin the process. Put yourself on the path where real change can occur. Opt for the system tool that will result in a healthier you. It’s true that Spiritual Defragmentation can be a lengthy process, but it is an essential part of regular spiritual maintenance. YOU choose to undergo Defragmentation by giving God access to every last bit of you through focused, quiet time – but the work isn’t actually yours. You sit there. Watching. Waiting. Knowing that good work is being done. Knowing that this is out of your control now. God Himself is doing His work and soon a new image will be displayed in you, with bits and pieces that have been rearranged and put back together in such a way that YOU look more like JESUS. Wow! What an amazing God! This entry was posted in Bible Study Chronicles, PINK Tuesday and tagged Celebration of Discipline, Christ, Defragmentation, Disciplines, God, Hard disk drive, Jesus, pink shoes ministries, Richard Foster, spiritual disciplines by Pink Shoes Ministries. Bookmark the permalink.